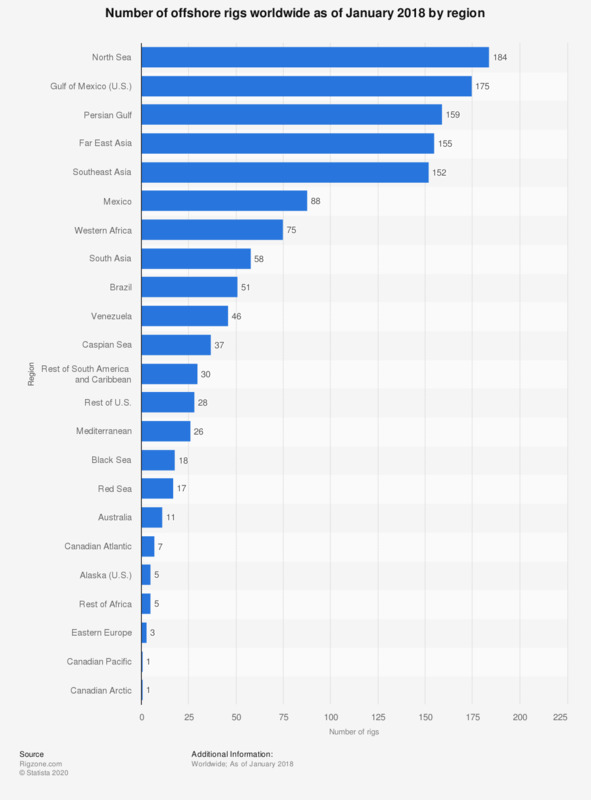 This statistic depicts the number of offshore rigs worldwide as of January 2018, sorted by region. At that point, there were 184 offshore rigs in the North Sea. The North Sea and the Gulf of Mexico (United States) are home to many offshore rigs, totaling 184 rigs and 175 rigs, respectively as of January 2018. Offshore oil rigs enable producers to extract and process oil and natural gas through drilled wells. Rigs can also store the extracted products before being transported to land for refining and marketing. There are several different types of offshore rigs for use in both large lakes and oceans such as fixed platforms that are anchored directly onto the seabed by concrete or steel legs and tension-leg platforms that float but remain in place by being tethered to the seabed. Nevertheless, there are some risks involved with the operation of offshore drilling, including explosions and fires. Pemex (NOC) and Saudi Aramco (NOC) operate many of the world’s offshore oil and gas rigs with 45 units and 44 units, respectively. Transocean Ltd., a Swiss company, is one of the largest offshore drilling contractors. In 2016, the company generated an estimated 3.89 billion U.S. dollars in revenue, but is expected to decrease its earnings to 2.9 billion U.S. dollars in 2017. Globally, the number of oil platforms is expected to rise from 389 units in 2010 to just short of 500 in 2017. Total rig fleet, including stacked and under construction rigs, in each region of the world where offshore rig activity is currently underway. Not all rigs listed are currently contracted/being utilized. Everything On "Global oil industry and market" in One Document: Edited and Divided into Handy Chapters. Including Detailed References. Statistics on "Global oil industry and market"